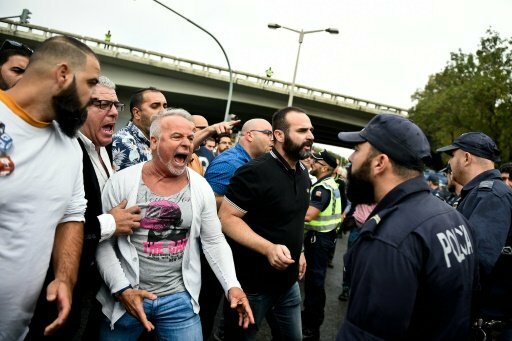 LISBON: Hundreds of taxi drivers blocked access to Lisbon airport and snarled traffic in the Portuguese capital on Monday as they protested against app-based ride-sharing companies such as Uber. Riot police scuffled with taxi drivers who refused to leave a roundabout leading to the airport, Portugal’s busiest. Police said they arrested three people who were involved in the disturbances. Without taxis, tourists arriving in Lisbon faced long queues to buy tickets for the metro or city buses, or resorted to the kind of ride-hailing apps which have angered taxi drivers. Some walked with their bags in tow towards the city centre. “It’s a real pain. It will take me almost as long to get to my hotel as it took to get to Lisbon,” said Roland Baak, 46, as he waited in line to buy a metro ticket after arriving from Amsterdam for a business meeting. Portugal’s two main taxi drivers’ associations had said they expected 6,000 taxis from across the country to descend on Lisbon for the protest, their third against ride-hailing apps in just over a year. Taxis honked their horns as they drove slowly towards the airport, creating delays during the morning rush hour. The cabbies complain that ride-sharing companies like US-based Uber and Spain’s Cabify are not covered by the same tax, training and safety regulations as they are and undercut their business. They oppose plans by Prime Minister Antonio Costa’s Socialist government to regulate such companies. The proposed law would require drivers that work for ride-sharing companies to have 30 hours of training, compared to 150 hours which is currently demanded of taxi drivers. It would also require cars used by ride-sharing firms to be less than eight years old and ensure drivers have passenger insurance. Taxi driver representatives said they would continue their protest after a meeting with Environment Minister Joao Matos Fernandes, who is in charge of transportation, produced no breakthrough. “We will stay here as long as it takes. We will set up tents to spend the night if it is needed,” said the president of taxi driver association Antral, Florencio Almeida.